There’s nothing more historical than U.S. Presidential elections. With Ted Cruz’s recent stunning endorsement of Donald Trump, I thought a little political humor I wrote below might help us get through the current election cycle. Brethren of the True Faith Mitch and Paul had spent over six years in the Desert, cast adrift among the sands. They took some solace from having prevented the Usurper from achieving most of his objectives. And now they smiled at one another, knowing the Usurper’s days were numbered. As they witnessed the fifteen from the Tribe and two outsiders enter the ring, surely, they thought, one of their peers will seize the mantle and lead the Tribe to victory in the Ultimate Battle against The Others. “Surely, we can simply anoint Sir Jeb as our champion,” whispered Brother Mitch. And, lo, it came to pass on the 462nd day, Brothers Mitch and Paul shielded their faces with their robes as the desert sands swirled around them. “And even Ladies Carly and Megyn,” said Brother Paul. “And Lyin’ Ted,” piped in Brother Paul. “Just how does he get away with it?” asked Brother Mitch. Suddenly, a great sand spout arose in the distance and headed directly toward the two great men. They ran in all different directions, but the sand spout shifted in turn and came to a halt before them. The sand spout disappeared as quickly as it arose, but in its place stood Lucifer in the guise of a well-tanned Wall Street banker. “Why,” said Brother Mitch, “we’d go to the ends of the Earth.” Brother Paul nodded in agreement. “Then you would throw your support behind The Fixer?” asked Lucifer. “But how?” asked Brother Mitch. “How can you make such a promise?” asked Brother Paul. “You are God?” asked Brother Paul. “And by what sign shall we know you can fulfill such a promise?” asked Brother Mitch. With that, Lucifer’s eyes flared again as he spun into a sand spout and disappeared from their sight. “What just happened?” asked Brother Mitch. This month marks the 150th anniversary of Union General U.S. Grant’s campaign to destroy Confederate General Robert E. Lee’s Army of Northern Virginia. As Virginia’s many rivers go, the Rapidan receives scant notice. Its headwaters begin 4,000 feet above sea level near the Big Meadows in the Blue Ridge. From there, the river descends east, gradually widening until it flows into the Rappahannock River northwest of Charlottesville and Fredericksburg. During the winter of 1863-1864, every American identified the river as the boundary line between General Meade’s Army of the Potomac and Lee’s Army of Northern Virginia. On Wednesday, May 4, 1864, Grant sent Meade’s 120,000 soldiers across the Rapidan on pontoon bridges constructed by the army’s engineers at two points: Ely’s Ford and Germanna Ford. Grant was determined to destroy Lee’s 60,000-man army and capture Richmond in the process. Throughout the month of May, Grant and Lee danced their deadly Tarantella, suffering losses in proportion to their numbers. In the Battles of the Wilderness and Spotsylvania Court House, the Union army suffered casualties – killed, wounded, or captured – of 36,000 men while the Confederate casualties totaled 24,000. To put the losses in perspective, one has to remember that the United States population today is ten times that of 1864 (taking into account populations both north and south). Despite the heavy losses, Grant continued forward, unlike the Union commanders who preceded him. He made “turn the left flank” the order of the day, and by Thursday, June 2, Union troops had fought their way within ten air miles of Richmond. Both commanders replenished their losses. Grant received 40,000 fresh troops in the second half of May, most from the “heavy artillery” units in and around Washington, who previously had seen action only on Washington’s parade grounds. Lee had to move Confederate troops south of Richmond and in North Carolina to bring his troop strength back to his original 60,000. By doing so, Lee risked a rout from the rear. June would open with a shocking loss for the Union troops. I will address that in another article. Most of this brief account is taken from my Civil War era novel, New Garden (pages 275-276), available on line from Amazon, Apple, Barnes & Noble, and Dog Ear Publishing. The novel is also available in Greensboro, NC, at the Greensboro Historical Museum and Scuppernong Books. Catton, Bruce. Never Call Retreat. Garden City, NY: Doubleday & Co., 1965 (republished by Fall River Press, New York, NY, in 2001). Foote, Shelby. The Civil War, A Narrative, Red River to Appomattox. New York, New York: Random House, 1974. The theme song from the 1930 movie “Chasing Rainbows” was the campaign song for Franklin D. Roosevelt’s successful 1932 Presidential campaign and would become the unofficial campaign song of the Democratic Party for years to come. But the song’s spirit aptly describes the atmosphere of Ulysses S. Grant’s first inauguration. Grant’s opponent, former New York Governor Horatio Seymour, had waged an ugly, racist campaign. During the months between his nomination in May and his election in November, Grant had spent most of his time in his hometown of Galena, Illinois, and the rest of his time exploring America’s Great Plains. As was customary in most Presidential campaigns of the nineteenth century, Grant had left the public speaking to others. The town’s citizens were in a celebratory mood. They had endured four years of war and almost four years with President Andrew Johnson and Congress at each other’s throat, culminating in Johnson’s narrow escape from conviction at his impeachment trial the past spring. Although the air was cool and misty on Thursday morning, March 4, 1869, eager onlookers crowded the streets of the nation’s capital. All of them wanted a glimpse of the President-elect, the man who had brought an end to the Civil War. Some in the crowd wanted to see the First Lady, Julia Dent Grant, bringing their spyglasses to determine if there was any truth to the rumor that her brown eyes peered in two different directions. Grant had won the election in an electoral landslide. Within the next few months, work crews two thousand miles to the west would complete the wonder of the age, the transcontinental railroad. Land-hungry men, North and South, were filling America’s vast territories. Scandals about Congressional bribes and generous payments to railroad companies would come, but on inauguration day citizens took a deep breath and celebrated the war hero who promised to bring peace to a recently reunited nation. Continuing last week’s theme, this article addresses the 1952 and 1956 Presidential elections, when Illinois Governor Adlai Stevenson II suffered resounding defeats at the hands of General Dwight Eisenhower, commander of the western allied forces in Europe in World War II. In the absence of a scandal, Eisenhower, like U.S. Grant 88 years earlier, was a shoo-in whether he ran as a Republican or a Democrat. With great justification Stevenson reluctantly accepted his party’s nomination in 1952. Having been bitten by the bug, however, he successfully pursued the nomination again in 1956 and was swamped by John Kennedy in 1960. His ambition irritated the Kennedy team and cost him the position of Secretary of State in 1960. Instead, he was relegated to serve as United States Ambassador to the United Nations, where he served with great distinction until his death in 1965. The Bushes and Clintons are not the first American political dynasties. They were preceded by the Kennedys and the Roosevelts (and, of course much earlier, the Adamses). Adlai Stevenson II also was part of a political dynasty. His namesake grandfather served as Vice President under Grover Cleveland. His maternal great-grandfather was one of the founders of the Republican Party, counting Abraham Lincoln among his friends. Adlai II’s father served as secretary of state in Illinois and his son, Adlai Stevenson III, served as a United States Senator. For much of this country’s history, America’s voters have elected Presidents with some history of military service. Until President Clinton’s election in 1992, every successful candidate for the White House since World War II had worn a military uniform. But for a down-cycle economy in 1992 and a thriving economy in 1996, it is unlikely Mr. Clinton would have broken the trend. Of our 44 Presidents, twelve have held the rank of general, with ten having seen battle action: Washington, Jackson, William Henry Harrison, Taylor, Pierce, Grant, Hayes, Garfield, Benjamin Harrison, and Eisenhower. Imagine two of the unsuccessful candidates who ran against the heroes of their day, former New York governor Horatio Seymour, who ran against General Ulysses S. Grant in 1868, and Illinois Governor Adlai Stevenson, who challenged General Dwight Eisenhower in 1952 and 1956. This article is limited to a discussion of Seymour. I will talk about Stevenson in my next article. Seymour had served two terms as governor of New York. In 1863, he had questioned the constitutionality of the Union’s conscription laws, largely because he believed they were tilted in favor of Republican congressional districts. During the New York City draft riots in July, 1863, he had addressed some demonstrators as “my friends.” The riots ultimately were extinguished by veterans of the Battle of Gettysburg. At the 1868 Democratic Convention, Seymour reluctantly accepted the nomination on the 22nd ballot. In the election campaign that followed, Seymour and his Vice-Presidential running mate, former former Union General Francis Blair, pursued a “white man’s” platform, arguing that the Republicans’ reconstruction policies should be nullified. President Johnson had narrowly escaped conviction in his impeachment trial only a few months earlier. 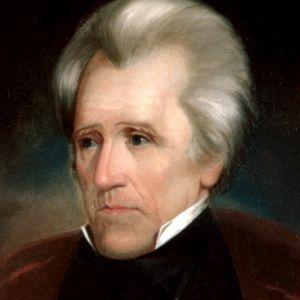 His impeachment had been due in large part to his resistance to reconstruction legislation (although the principal pretext for impeachment had been Johnson’s non-compliance with the highly controversial, and certainly unconstitutional, Tenure of Office Act). Americans had just suffered through four years of civil war and three years of Johnson and the Congress at one another’s throats. And Seymour thought they wanted more of the same? Seymour did win over 47 percent of the popular vote, but Grant won the electoral-college vote in a 214-80 landslide. Seymour won New York, New Jersey, Delaware, Maryland, Kentucky, Oregon, Louisiana and Georgia. Three Southern states – Virginia, Mississippi, and Texas – had not been readmitted to the Union, and therefore did not participate in the election. As I stated earlier, Grant was the hero of his age. He had “conquered the peace,” bringing an end to four bloody years of conflict. It is unlikely any Democratic candidate could have beaten Grant, particularly when many Americans believed the Democratic Party had brought on the war with their contentious 1860 Presidential nominating conventions in Charleston, South Carolina, and Baltimore, Maryland. Republicans waved the “bloody shirt.” Americans were not going to turn the White House over to the party they deemed responsible for over 600,000 American lives. In 1850, Congressional leaders made their last valiant efforts to forestall conflict between the North and the South. However, in their attempts to reach some form of compromise, they unwittingly set the stage for the Civil War. Some might say that civil war was the price the United States paid for orchestrating war with Mexico in 1848. By invading Mexico, or at least by sending troops to contested territory, the United States ultimately gained a huge swath of land that included modern day California, Nevada, New Mexico, Arizona, Utah, and Colorado. Like Thomas Jefferson before them when he negotiated the Louisiana Purchase, most American leaders probably believed it would take generations before much of the new territory would be ripe for statehood. But history is full of unforeseen consequences, and James Marshall’s gold discovery in Coloma, California, accelerated the process by attracting sufficient numbers of Americans who wanted statehood. More importantly, California’s citizens had enacted a constitution that prohibited slavery. For years, Southern leaders had sought to maintain balance in the United States Senate, admitting a free state to the union only while admitting a slave state at the same time. In 1850, they had many demands on the table: carving up Texas into a number of states in an effort to maintain equal representation in the Senate; continued legality of slavery in the nation’s capital, anathema to antislavery Northerners; and a stricter fugitive slave law to insure recovery of runaway slaves. Anti-slavery forces in the North also had an agenda: admission of California and other future states acquired from the Mexican War as free states and abolition of the slave trade in the nation’s capital. 1850 also saw the last great stand of the Senate’s most famous orators: Daniel Webster of Massachusetts, John Calhoun of South Carolina, and Henry Clay of Kentucky. Clay sought to ease tensions by proposing a series of resolutions. Each resolution offered something to the North, balanced with an inducement to the South. His strategy failed, but Illinois Senator Stephen Douglas, Lincoln’s chief opponent for the presidency ten years later, succeeded by gathering enough votes from Upper South and Midwest representatives, who approved the package as a whole. 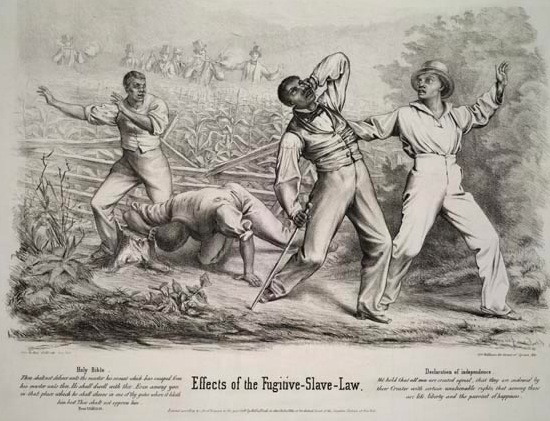 Before the Compromise of 1850, a 1793 federal statute authorized Southerners to enter free states to capture runaway slaves, but state authorities were not obligated to enforce the law. Prigg v. Pennsylvania (United States Supreme Court 1842). One of the compromise’s components, the Fugitive Slave Law, sought to remedy Southerners’ dissatisfaction with existing law by creating a category of federal commissioners empowered to arrest and return runaways to their owners. The law also gave the commissioners authority to deputize any citizen to assist in enforcement of the law. While many Northerners did not object to slavery where it lawfully existed, they took great exception to playing any role in its enforcement. Southern slave owners, who thought they finally had obtained a meaningful process for retrieving their fugitive property, fumed about Northerners’ resistance to the law’s enforcement and Northern states’ passage of personal liberty laws designed to thwart the enforcement of the law. Within a year of the law’s enactment, it became clear that enacting a law is considerably less difficult than executing it. After 1851, few runaways were returned to their owners under the auspices of the Fugitive Slave Law. For a fictional but faithful account of a runaway slave’s stop at an Underground Railroad station, please see the “Runaway” chapter in my historical novel, New Garden, available on line from Amazon, Apple, Barnes & Noble, and Dog Ear Publishing. The novel’s “Charleston” chapter about the Democratic Convention of 1860 also depicts Southern politicians’ dissatisfaction with Northerners’ resistance to the Fugitive Slave Law. For a more detailed historical account of the Compromise of 1850 and the Fugitive Slave Law, see Professor James McPherson’s Ordeal by Fire, pages 70-89 (3rd Edition, McGraw Hill 2001).